In recent years, an increase in diseases and accidents have been reported due to the presence of adverse psychosocial factors in the workplace. 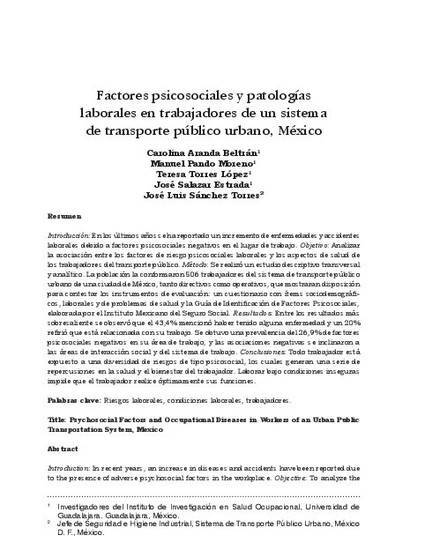 Objective: To analyze the Association between psychosocial factors at work and health aspects of public transport workers. Method: We conducted a crosssectional descriptive and analytical study. The population was made up of 506 workers (census) of an Urban Public Transport System of a city in Mexico including top management and operational personnel, that showed a willingness to answer the assessment instruments: A questionnaire with items of social-demographic, labor, and health problems and the Guidelines for the Identification of Psychosocial Factors developed by the Mexican Social Security Institute. Results: Among the most striking results we found that 43.4% reported having had an illness and 20% said that it was related to their work. The prevalence was 26.9% of adverse psychosocial factors in the work area, and the negative associations leant towards the areas of social interaction and the working system. Conclusions: Any worker is exposed to a variety of psychosocial risks, which generate a series of impacts on the health and wellbeing of the worker. Unsafe working conditions do not allow the worker to performhis/her functions optimally.